The table on the following pages summarizes the World Health Organization Medical Eligibility Criteria for Contraceptive Use. These criteria are the basis for the Medical Eligibility Criteria checklists in most chapters of this handbook on family planning methods. These checklists are based on the 2-level system for providers with limited clinical judgment (see table below). The checklist questions address conditions in MEC categories 3 or 4 that the woman knows of. The boxes “Using Clinical Judgment in Special Cases” list conditions that are in MEC category 3: The method can be provided if other, more appropriate methods are not available or acceptable to the client, and a qualified provider can carefully assess the specific woman’s condition and situation. Note: In the table beginning with Personal Characteristics and Reproductive History, category 3 and 4 conditions are shaded to indicate that the method should not be provided where clinical judgment is limited. Categories that are new or changed since the 2011 edition of this handbook are shown in dark type. 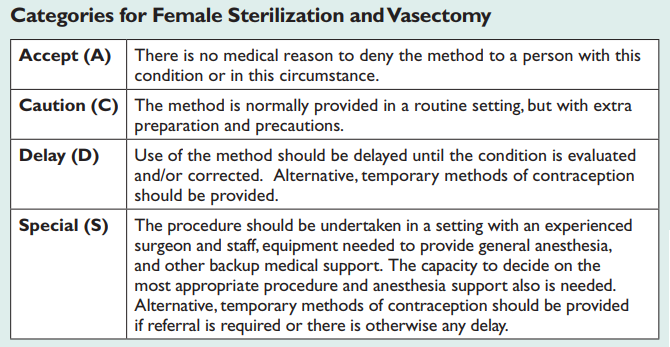 See conditions relating to vasectomy, male and female condoms, spermicides, diaphragms, cervical caps, and lactational amenorrhea method. See conditions relating to fertility awareness methods.